Legend has it that there’s a dragon at Killerton in Devon. It lives on top of the Iron Age fort overlooking this National Trust house and estate. Last month we went in search of the dragon with our two pre-schoolers and their grand parents. Numbers are important in this type of situation! Killerton is one of the largest estates looked after by the National Trust – 10 square miles in all, with farms, woods, orchards and parkland full of wildlife and outdoor activities for visitors. In 1944, Sir Richard Acland gave the estate to the National Trust because he did not believe in land ownership. This political decision is a boon for people visiting Killerton today. We arrived just before lunch and decided to stretch Tin Box Dog’s legs in the extensive parkland. Dogs must be kept on leads on the main drive away and are not allowed in the gardens around the house or chapel. However well behaved pooches can come off the lead in the parkland. TBD enjoyed joining us to explore for the first part of our visit at Killerton. Having been told about the legendary dragon who is said to live in The Clump enclosure we began to climb the hill to see what we could see. The dragon, known as Dolbury, is said to guard a hoard of treasure buried in the hill. We were on a mission to find him. On the way we were distracted by some of the tree swings that are dotted all over the estate. It was here that I took one of my favourite pictures of the summer featuring Tin Box Baby and her grandparents. We continued our search for Dolbury. At the very top of the hill we found a nest and some lovely views but sadly no dragon. Do let me know if you’ve visited and spotted Dolbury. Before we’d given up our search for the dragon, Tin Box Tot had dragged Grandma off to a den building area we’d passed earlier. Tin Box Tot was a hard task master and had us all stacking branches up against one of the tree stumps in the clearing until she was satisfied the job was done. It took some time to meet her requirements for the perfect den! Families looking for somewhere to let their kids run off steam will enjoy the grounds and outdoor activities at Killerton. You can even bring your own bikes and cycle the paths around the estate. It was now well past lunch time, which is a risky time with two small tummies beginning to rumble, not to mention four large ones. It was time to find something to eat. Mr Tin Box took Tin Box Dog back to the car while the rest of us walked through the gardens at the back of the house. On the way we found the estate war memorial and Bear House, once home to a real bear brought to the UK from Canada. We reconvened for sandwiches and hot drinks at the Dairy Cafe at the back of the house. While we were eating our late lunch under a huge umbrella on the terrace, the weather took a turn for the worse. Luckily, our next place to explore was the house. The Acland family owned the estate from the 1600s to 1944 when it was gifted to the National Trust. The current mansion was built in 1775 as a stop gap while plans for a grander stately home were drawn up. The bigger and better Killerton House never came to fruition but the existing one was modified and extended over the years. I always enjoy looking around stately homes and imagining what it must have been like to live in them. With two pre-schoolers more interested in getting muddy on the playground than playing princesses, this can be a challenge. However, the National Trust always has children’s trails around their properties and Tin Box Tot loves these. At Killerton her challenge was to find toy mice hidden in each room. An added bonus was the Rainbow Room upstairs in the resident fashion exhibition. The girls had draws full of different materials to pull out and turn into outfits using pegs and accessories. This year’s fashion exhibition ‘Fashion to dye for’ includes work by students from Exeter College. Please note that the exhibition is taking a break in 2017 for conservation work on the second floor of the house. All in all it took less than an hour to explore the house – just about the right amount of time with two small kids. 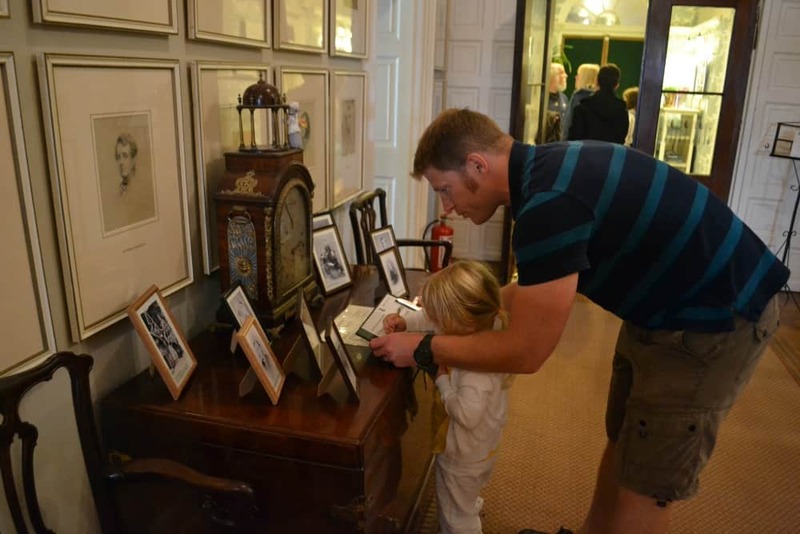 Killerton offers facilities to make life easier for visiting families: there’s a buggy park in the house and baby changing in the toilets at Dairy Cafe and at the Estate entrance. There were high chairs available at the cafes and restaurants but they were a bit tight for space if you have a pushchair with you. We followed our Satnav from the south and were taken on some narrow, minor roads. Better routes are from Junction 28 or 30 off the M5 through Cullompton town centre. So, we didn’t find a dragon but we did enjoy a full day at Killerton with the whole family. 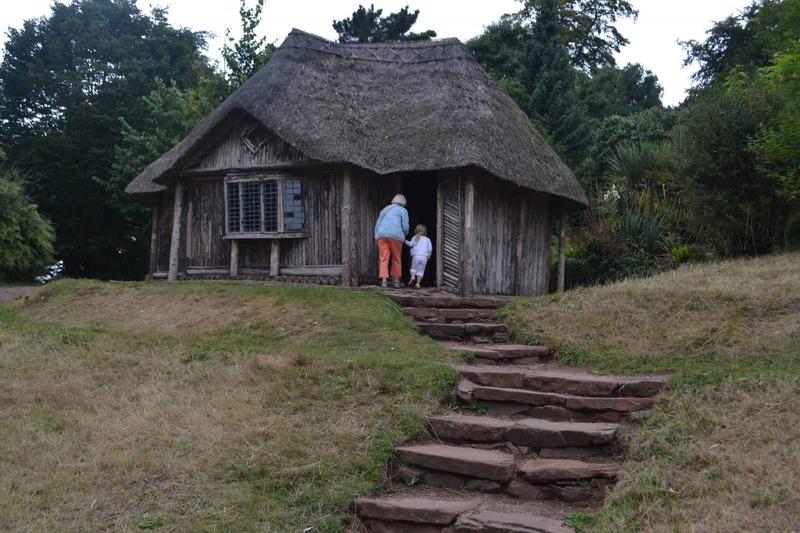 Have you visited Killerton National Trust with children? What were the best bits for you? If you’re looking for other days out with children in Devon check out my 55 great days out post. Disclosure: we received free entry to Killerton in exchange for a review. All opinions are mine and those of my family. I’ve come to have a look at the ages of your children – not too different from mine. Your photos of the property are lovely. What a shame you didn’t spot a dragon this time. next visit, perhaps! It is lovely at Killerton. The National Trust seem to have a really good formal going for keeping kids entertained. What a beautiful place. I love National Trust properties and we invested in a membership with them this year. There’s always so much to do and see. Thanks Heidi. We are going to more National Trust properties now our girls are both walking. There’s always so much to keep them occupied. Killerton looks like a lovely place to explore with so much open space and different areas to see and so many activities to take part in. Hunting for dragons sounds like a great way to get the kids out exploring in the fresh air with their minds full of magic and mystery. What a lovely shot of Tin Box Baby and her grandparents on the swing, so many happy faces Tin Box Tot looks like she’s having a wonderful time leading the den building too. 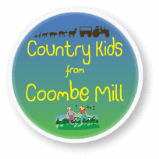 Thanks for linking up and sharing with me on #CountryKids. I love National Trust places as there’s so much history behind them.We’re NT members but this might be a bit far for us to travel by train.I so want to go into that hut. It was really interesting inside. Every surface was made using different natural materials. Love the photo of you on the swing – and the look on TB Tot’s face during the dragon hunting: determined concentration! Sounds a great one to visit.